China's Foreign Ministry expressed its appreciation for Trump's gesture, which could help smooth crucial trade talks that start Tuesday as China's top economic official, Vice Premier Liu He, arrives in Washington to meet with Treasury Secretary Steve Mnuchin. The two sides have so far imposed or threatened each other with billions of dollars in tariffs and failed to significantly narrow their differences when Mnuchin led a delegation to Beijing earlier this month. "The Chinese have suggested that ZTE was a show-stopper — if you kill this company, we're not going to be able to cooperate with you on anything," says Scott Kennedy, an expert on China's political economy at the Center for Strategic and International Studies in Washington, D.C.
And President Trump needs China's cooperation in ironing out the trade spat, not to mention North Korea and a host of other issues. 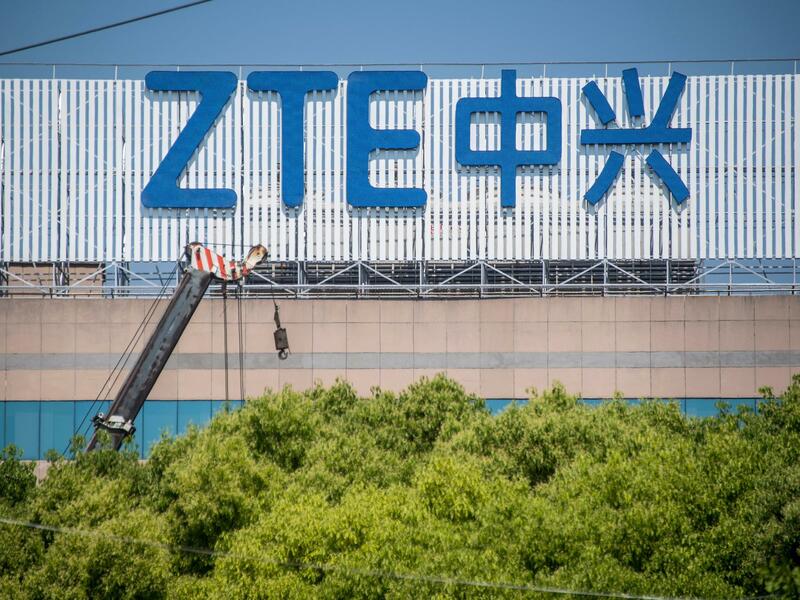 The ZTE case predates the current U.S.-China trade spat. In March 2017, the Commerce Department hit ZTE with a $1.2 billion penalty for violating U.S. sanctions on Iran and North Korea, and for misleading the U.S. government about the firm's actions. ZTE was also slapped with a suspended seven-year ban on the purchase of U.S. tech products. That ban was activated last month after the U.S. found out that ZTE failed to come clean about its operations. "ZTE made false statements to the U.S. government when they were originally caught," Commerce Secretary Wilbur Ross said in a statement last month. ZTE "made false statements during the reprieve it was given, and made false statements again during its probation." ZTE announced May 9 that its operations had ground to a halt because it was unable to purchase the microchips it uses in its products from U.S. companies including the San Diego-based firm Qualcomm. Chinese observers were despondent to find that one of their country's top companies, which sells network equipment and cell phones all over the world, is "hollow at its core" and reliant on the U.S. for its microchips. "The U.S. is moving against ZTE because it wants to knock China out of its leading position in 5G mobile communication technology," fumed Hu Xijin, the editor of China's nationalist Global Times tabloid, in a post on the Weibo microblog platform. "Chinese society must support ZTE," he said (although some needled him for sending the post not from a ZTE smartphone, but an iPhone). ZTE's situation convinced many Chinese that rather than being dependent on foreign suppliers, the country must manufacture key technology products itself. This notion is behind Beijing's industrial policy, known as "Made in China 2025." The policy involves subsidizing Chinese firms so they can dominate domestic markets for hi-tech products such as artificial intelligence and new energy vehicles. The U.S. government sees the plan as a threat, and proposes to target it with tariffs on China's tech exports. Douglas Fuller, an expert on China's tech policies at Zhejiang University in Hangzhou, says the U.S. could have taken smarter action against ZTE, without hurting U.S. producers that sell it products and "antagonizing China to double down on more techno-nationalist import substitution policies." Those policies did not start with Made in China 2025. Beijing-based economist Hu Xingdou says China has practiced them to some extent for two or three decades. Their proponents can point not only to Asia's main economies as fellow practitioners, but also to a young U.S.
Hu notes that President Trump's "America First" economic nationalism harks back to the ideas of Alexander Hamilton, who argued in 1791 that free trade would work only "if the system of perfect liberty to industry and commerce were the prevailing system of nations." But as it was not, Hamilton contended, the U.S. should protect its industries with tariffs, while supporting them with "bounties" — government subsidies. Hu believes President Trump may be willing to ease up on ZTE in order to protect the overall economic relationship. "The U.S. still needs China," he says. "If the U.S. causes China's economy to collapse, it won't do the U.S. much good, and the U.S. will lose markets for its core technologies." As for Chinese industry, for now, at least, it "is deeply integrated in global supply chains," observes Kennedy. And "China's economic success depends on continued connectivity to the global economy." But he concedes: "I guess there's a balance between needing that connectivity and wanting to reduce your vulnerability" to foreign blockades or reprisals. He notes that China has so far been comfortable with importing large quantities of food, energy and other commodities, because buying them on international markets is less costly than self-sufficiency. But high-tech products are another matter, Kennedy notes, as they are deeply associated with national security and military superiority. Both the U.S. and Chinese governments are suspicious that each others' chips and phones may contain "back doors," compromising the security of users' data. Hu says some members of China's liberal minority worry that the country's security fears "could cause it to close itself off, over-emphasize self-sufficiency or even revert to the era of Chairman Mao." But the majority in China sees things from a more nationalist perspective, Hu says, which the ZTE case has merely reinforced.